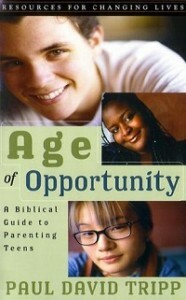 Age of Opportunity is written for Christian parents of pre-teens and teenagers. The author, Paul Tripp, is a pastor and conference speaker and served as a counsellor and faculty member at CCEF for many years. This book encourages parents to look firstly at their own hearts, allowing God’s word to penetrate and transform them, and after that their parenting. A chapter-by-chapter study guide gives practical instruction on how to apply the principles of the book in their families. Moving away from a “behaviour modification” approach to one that enables teenagers to see their need for Christ and recognise the goodness of His wisdom. Learning to see “troubles” as God-given opportunities in which parents can be “salesmen for God’s wisdom”. Learning how to use questions – loving questions which help parents understand their teenager more deeply and which enable the teenager to recognise their own motivations and how they need to grow and change. I highly recommend this book for use 1) by parents, 2) in small group parenting courses in a local church, and 3) as homework in individual or family biblical counselling sessions. My experience in biblical counselling and in leading parenting groups is that parenting is most powerfully impacted when parents use the study guide after reading each chapter. However, churches using parenting classes as outreach to unbelievers should note that this book is written for parents who are already familiar with the Bible. Founded on a biblical worldview, it uses spiritual language which may not be understood by those unfamiliar with it. It is designed not to change parenting behaviours so much as to enable spiritual growth in Christian parents, through the work of the Spirit applying the gospel to their lives. Overall, Age of Opportunity is an excellent resource for changing the hearts of believing parents, by the power of the Holy Spirit, and to enable them to bring glory to God as they raise their teens. Reviewed by Linda Ayers, a Certified Biblical Counsellor with the Association of Certified Biblical Counsellors (ACBC). Originally from the USA, Linda currently lives near Aberdeen with her husband where she works with her local church as a biblical counsellor.